15 inch netbook. What is an AMD Fusion doing in a 15.6 incher? Is it for the price tag of 299 euros? Or can the G575 rightfully be seen as a high performance office companion? We've put the free DOS budget laptop through its paces. 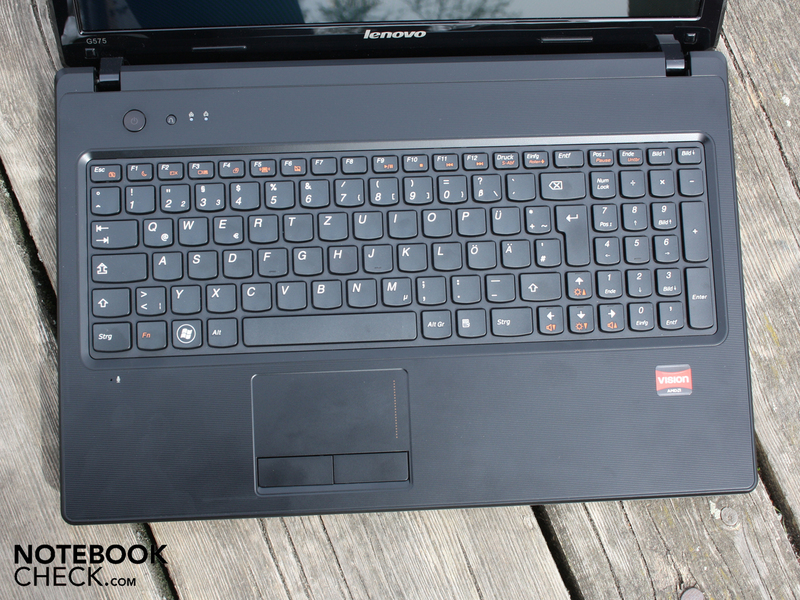 Lenovo G575: What good is a laptop that only costs 299 euros? The word has spread – no one has to spend more than 400 euros for a simple laptop. 15.6 inch entry level machines can already be found for 300 euros. AMD Athlon / Turion / V series and Intel Pentium Dual Core processors move within the field of the toughest price war. If you want to be up to date, you'll naturally need a graphics card and a good battery life – no matter how tight your budget might be. 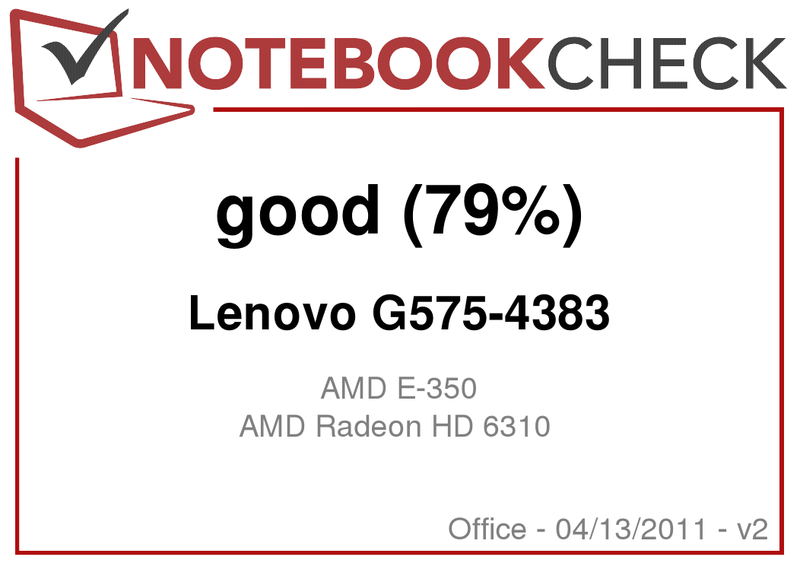 The AMD Fusion notebooks promise exactly that. At an apparently attractive price of 299 up to at most 400 euros, an AMD Radeon HD 6310 moves in. That sounds good and the mysterious AMD E-350 processor is almost history. What the novice doesn't see in Media Markt: The AMD Fusion platform of this 15.6 incher has been developed for high performance netbooks and small subnotebooks. 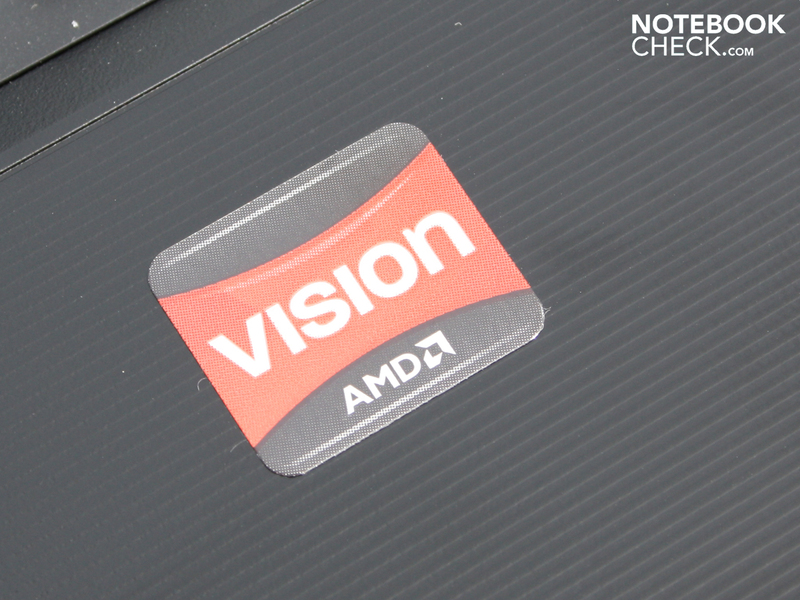 Fusion is AMD's attack on Intel's Atom. So, what is an E-350 looking for in a standard laptop? Does it have enough power for office and entertainment use? 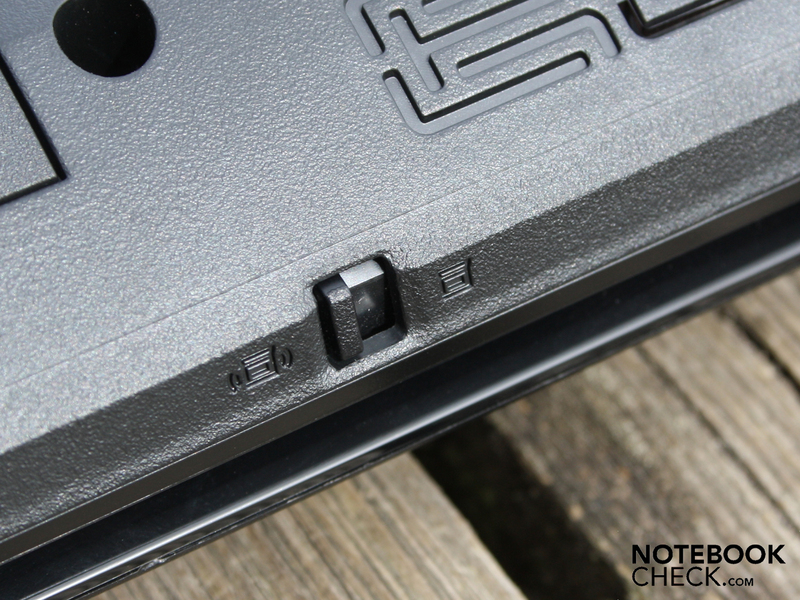 Are input devices, workmanship and display just as cheap as the price? 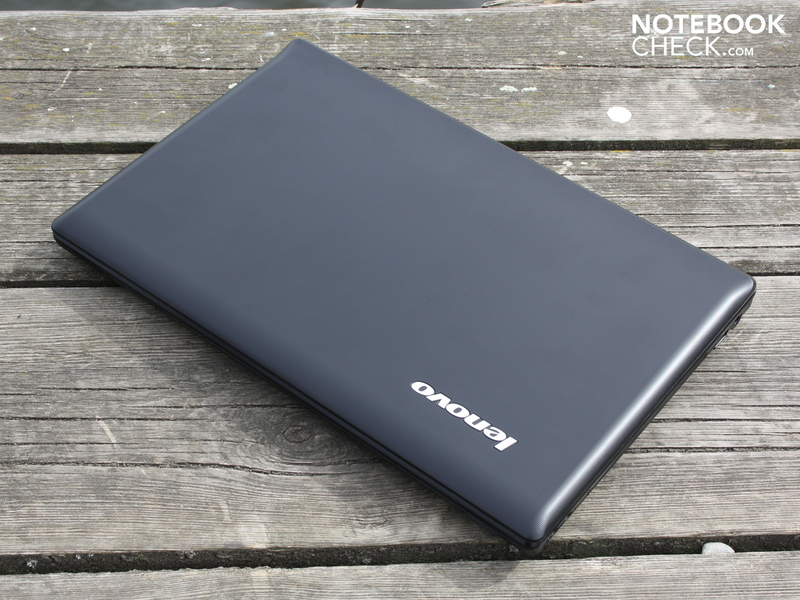 In terms of looks, the Lenovo G575 conveys a cleanly assembled plastic charm. Matt austerity everywhere you look. Merely the display shines with black piano lacquer. Lenovo hasn't used adorning ornaments, such as silver strips, glowing LEDs or stylish power on buttons, for cost reasons. 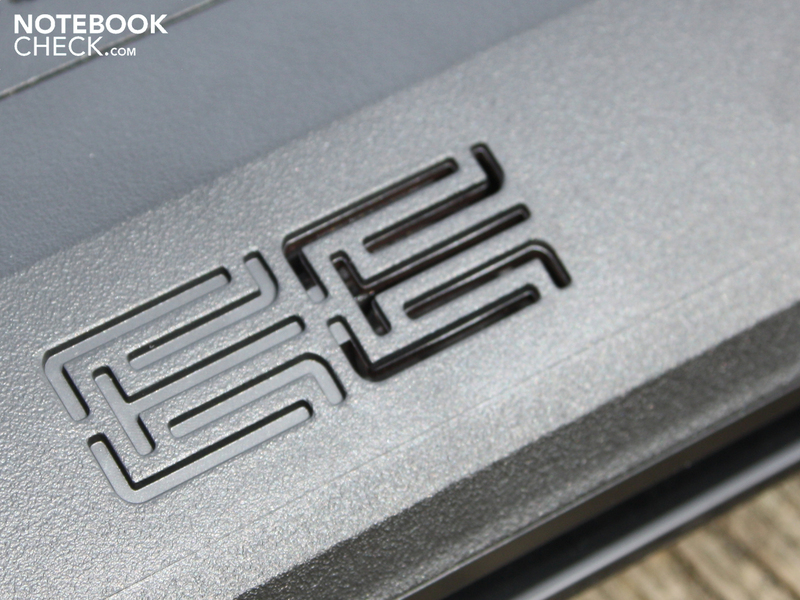 However, Lenovo hasn't left out the presentation of its logo. The emblem is embedded into the lid with silver letters. The lid's and work surface's matt surfaces are made of smooth plastic, which supplies good haptical feedback and grip due to the grooves. The base plate is also made of corrugated plastic. The case stands out with a good pressure resistance of the work surface and, to the largest part, base plate. The wrist-rest doesn't yield at all under the weight of our hands. However, the 15.6 incher should stay on the desk because the base unit clearly deforms and bends when it's handled. 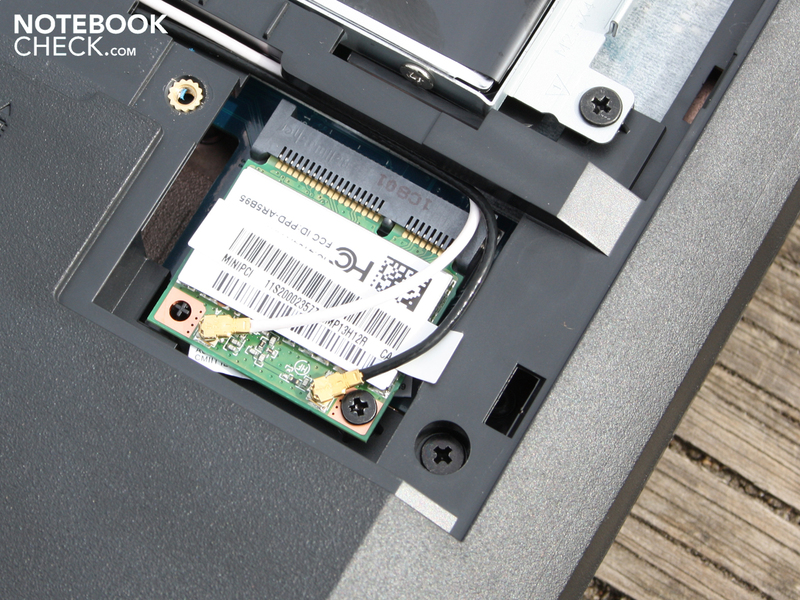 For example, one weak point is the pliable area beneath the optical drive. The lid isn't kept particularly tight in place by both small hinges. The lid falls into the teetering stop position almost by itself in the greatest opening angle (about 135 degrees). The lid teeters obviously and is annoying during rough car trips. Feng shui fans will be attracted by the minimalistic interface configuration. If you are looking for variety, you needn't read further. The connections are concentrated on the case's left. The user finds the obligatory Ethernet RJ45 for the network card, the VGA for the external TFT and three USB 2.0 ports for peripherals. One of the USB 2.0s looks like an eSATA, but turns out to be a common USB 2.0. The lack of a digital video port, HDMI/display port, is painful since the G575 can't be connected with a TV set. That minimizes the possibilities for the AMD Fusion range, optimized for HD movies (hardware support from the Radeon GPU). A FullHD TFT can only be connected imperfectly via VGA and without sound. The case's right is adorned by two audio sockets and another USB 2.0 port. 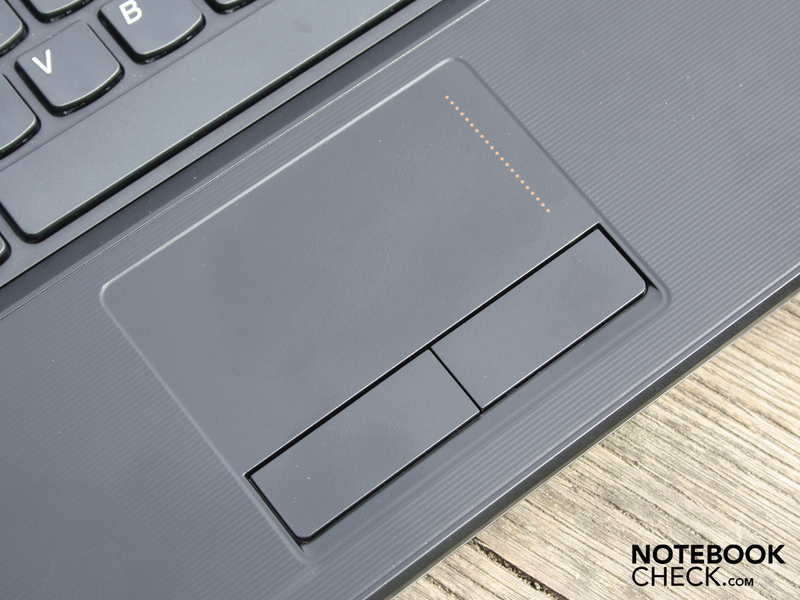 Lenovo has placed the cardreader invisibly on the laptop's front. There is uncertainty about the supported formats since there is no sticker. 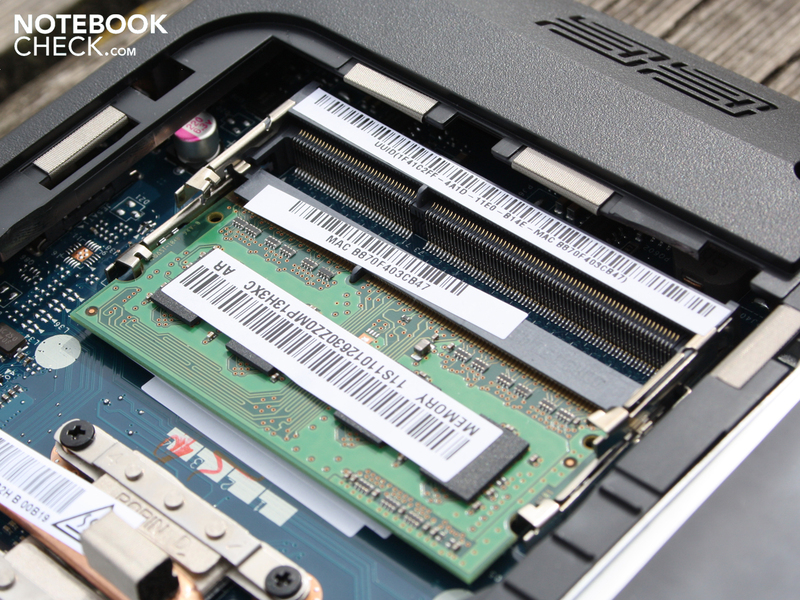 According to Lenovo's information, it should be SD and MMC memory cards. There aren't any other wireless technologies apart from WLAN draft n (Atheros AR9285) in the G575. Bluetooth isn't included. At least the Atheros AR8151 PCIe gigabit card isn't scanty. It can be transmitted to the home network in the maximum possible speed. An existing gigabit switch is, of course, a requirement. 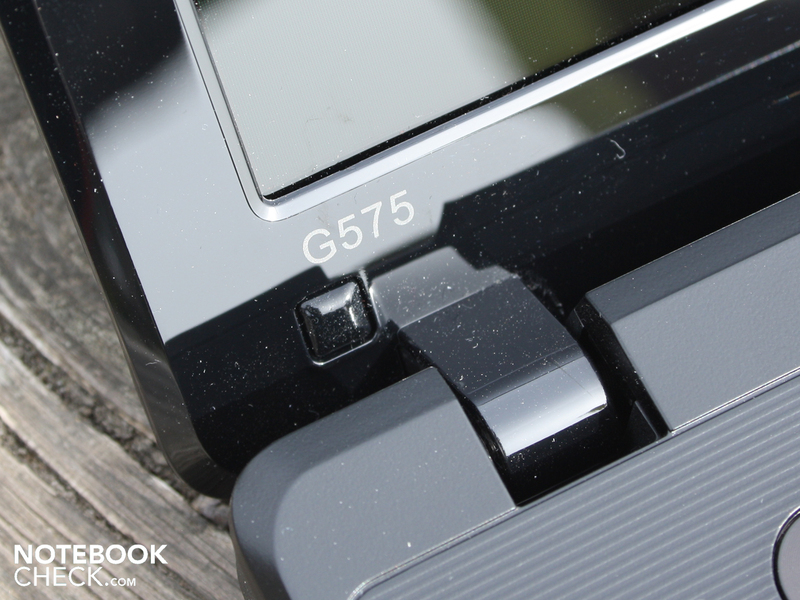 The buyer won't need any recovery data carriers for the G575 since it's delivered without an operating system. There is merely a driver DVD included. It can be used to install all Windows drivers one after the other. We installed Windows 7 Home Premium 64 bit for the test. Thus, the buyer is free to choose the operating system as he prefers. 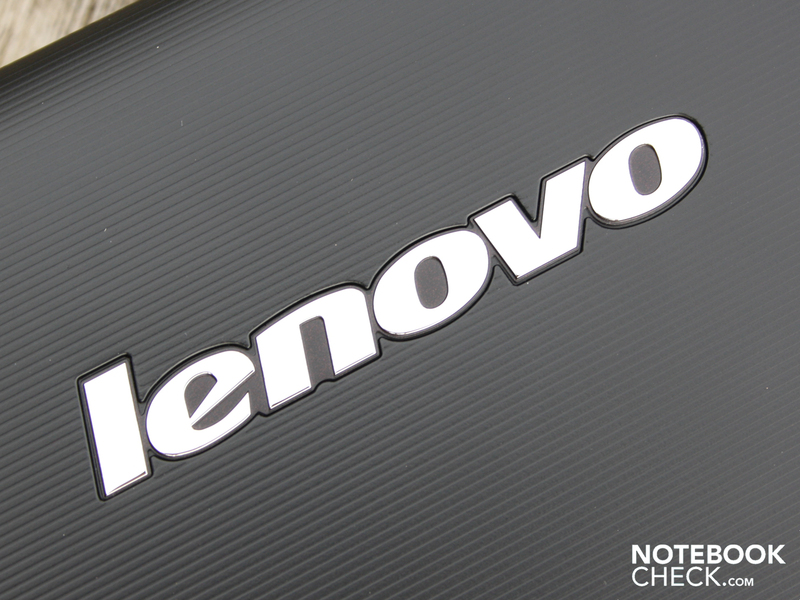 Lenovo only offers a 12 month warranty for its budget G models. The laptop has to be sent in (bring in) by the customer. There is a 3 year collect & return warranty for about 150 euros available as an extension option. 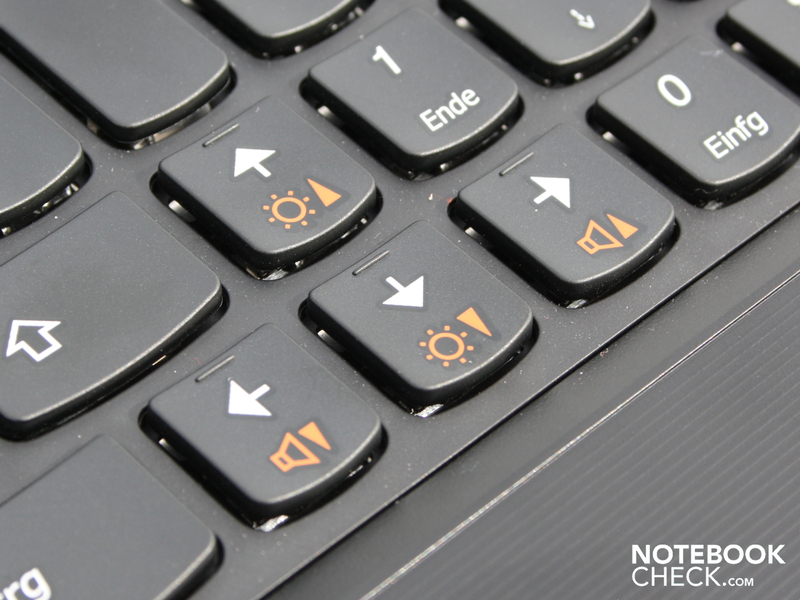 Good news regarding the keys: The keyboard is suitable for prolific typists if they can ignore a few minimized keys. The embedded keyboard's single keys are clearly concave, so have an inward cavity, and thus increase the fingers' accuracy considerably. The pressure point is clearly palpable, the key drop is medium and the stroke is firm. The keyboard fits tight over the entire width. Only strong pressure applied above the optical drive can make it dent. 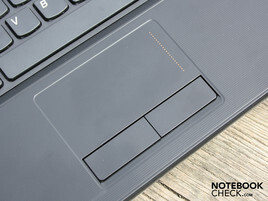 Lenovo installs a number pad with a standard layout which emphasizes the office claim even more. The number pad facilitates inputting numbers. The keys are a bit narrower than the letter keys, but are an acceptable compromise. The minimized keys, like enter, right shift, backspace and the squeezed in arrow keys are the biggest flaw. We like the keys' clear, white lettering. The red function keys for opening special functions, such as display brightness, volume, mute, play/stop or WLAN activity, can be seen well. Even the touch-typists markings are clearly palpable. The touchpad is integrated in the wrist-rest. The difference to the haptically textured wrist-rest is made clear by a small edge which can be felt very well. The surface is sensitive up to its outer edges. Both mouse keys are submerged in a hollow. The keys have a low key drop, but a clear pressure point. The stroke is rather firm. 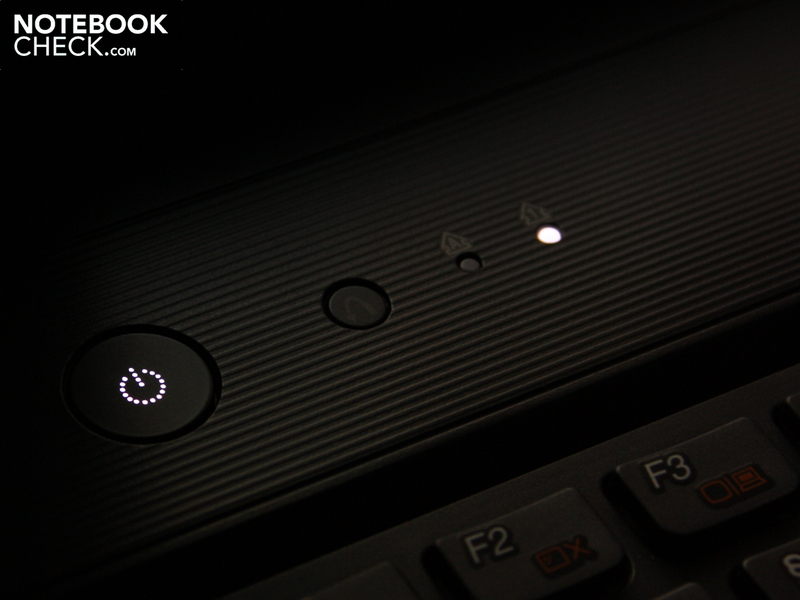 It's possible to work quickly with the multi-touchpad (Synaptics V7.2). The haptics are pleasant and two-finger control works perfectly. The vertical scroll bar for traditionalists is visibly marked; the horizontal one only has to be enabled. The reflective screen (model: LP156WH4-TLA1) has a resolution of 1366x768 pixels. The pixel distribution is very similar to an aspect ratio of 16:9. The LG Philips screen is weak in many things, but that is standard for the budget office category. It starts with the low contrast of 154:1. The glare-type screen improves color perception a bit, but it can't change the measurement. The office fan would have preferred a matt display. Moreover, the screen isn't suitable for professionals due to its small color spectrum. 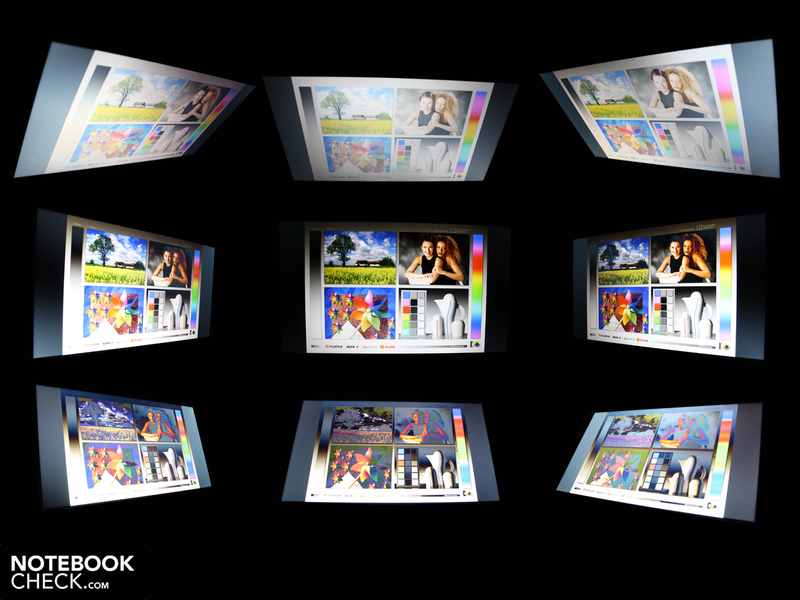 The extended sRGB color space is far from being reached. 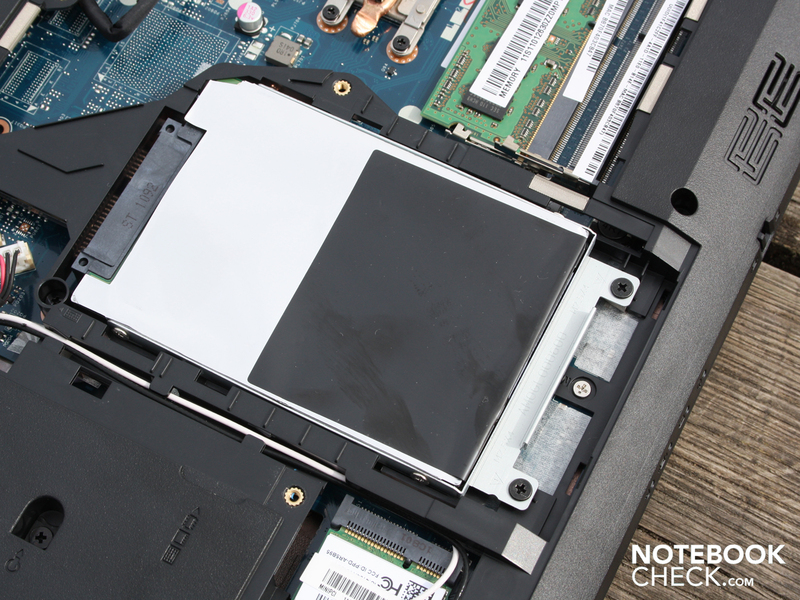 We compare the screen with AdobeRGB (t), sRGB (t) and the good consumer TFT in the Vaio EB4X1E (t) in the following pictures. 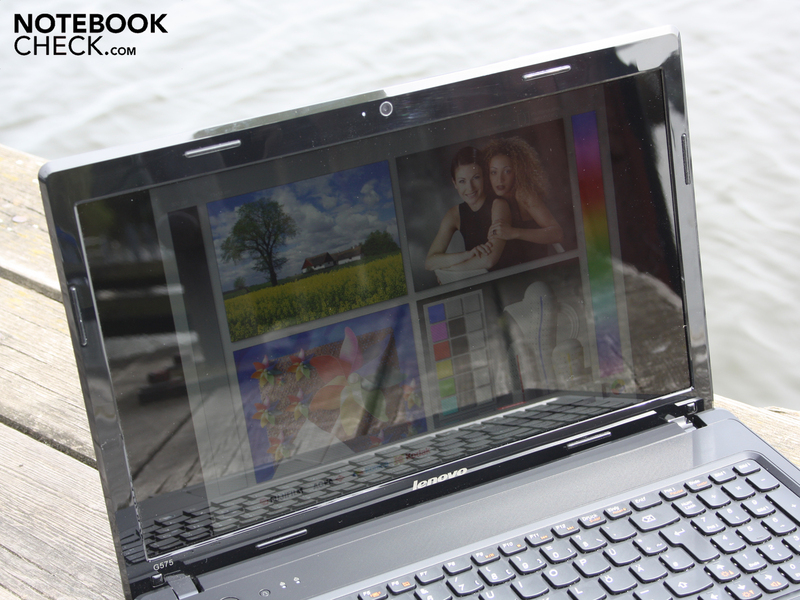 The backlight distributes the brightness very evenly over the screen (90%). This means the LED backlight's deviations are very minor. No bright/dark spots can be seen on the surface. Basically, the average brightness of 225 cd/m2 is quite good. 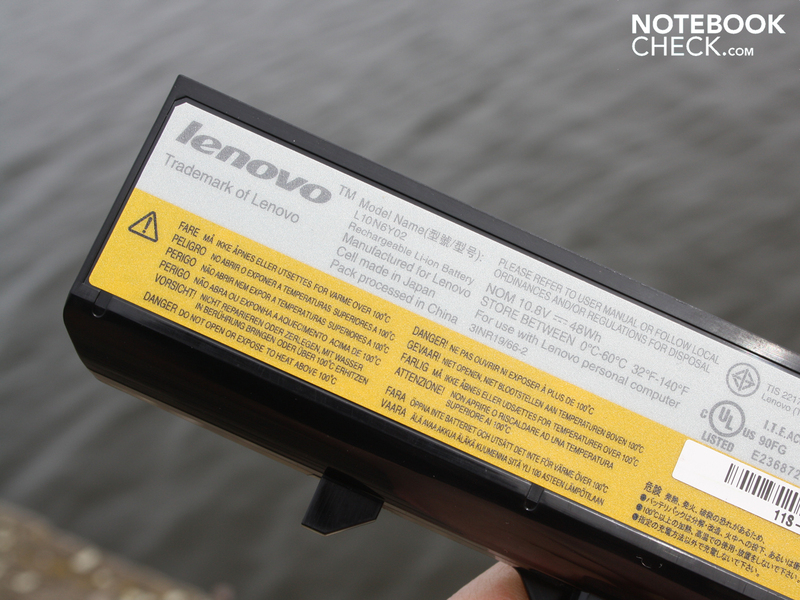 The G575's display is unsuitable for outdoor use. 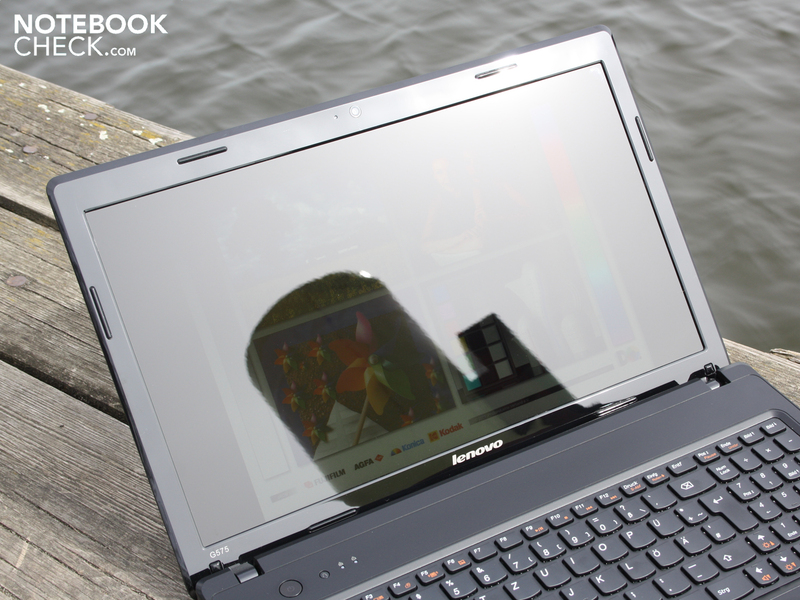 Theoretically, the brightness is sufficient for outdoors – but only if it's cloudy or the laptop is in a shady place. The devastating reflections caused by the glare type TFT deter sun worshippers from their undertaking. The view can deviate up to 45 degrees from the front horizontally. The screen dims and colors falsify beyond that. This effect starts with a slight deviation of only 15 degrees vertically. The image starts to faint evidently and the colors invert then. We experience major restrictions when looking down or up from the side. 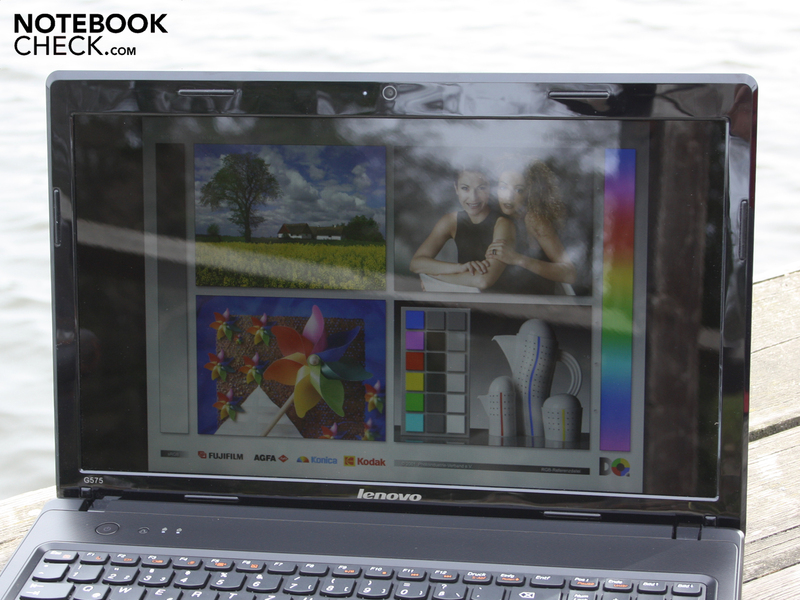 Lenovo equips the 15.6 incher with the dual core APU, AMD E-350 (2x1.6 GHz). This accelerated processing unit with a TDP of 18 watts has an incorporated graphics unit with DirectX 11 and UVD3 video decoder. The latter is for decoding HD videos (MPEG-2, H.264, VC-1). Therefore, the platform designed for netbooks shouldn't have trouble playing FullHD or BluRay picture-in-pictures. The APU E-350 exploits the Radeon HD 6310. The incorporated GPU easily defeats the 2010 Intel HD with 80 shaders and the aforementioned UVD3 and should be on par with Nvidia's Ion. It wouldn't do as well in comparison to the brand new Intel HD 3000 though, albeit the UVD3 remains to be an advantage. The APU only has an L2 cache of 1024 KB. It is supported by 2048 MB of DDR3 RAM (1 slot empty). We installed the 64bit Windows 7 Home Premium for the best possible exploitation of the 64 bit APU. The G575 is delivered without an operating system (free DOS). A comparison with an Intel Core i3 or i5 would be unfair in processor computing performance. AMD's Fusion is hopelessly inferior to these cores. We compare the AMD E-350 (2x1.6 GHz) with Intel's Atom dual core processors, which also aim at mobility. Alike the Atom N550, simultaneously executed multi-tasking operations can calculate on two cores. In the multi core benchmark, Cinebench R10 32 bit, the G575 achieves 2022 points. An Atom N550 only achieves 1463 points. The N550 is therefore averagely 30% slower. The little sister, AMD Fusion C-50 (Toshiba NB550D) can't keep up anymore. It is slower by about 40% with 1271 points in Cinebench R10 Multi 32 bit. The E-350 only achieves 1154 points in single core processing (Cinebench R10 Single 64 bit). The 1.6 GHz doesn't stand a chance in face of the higher clocking Pentium P6100 (2584). 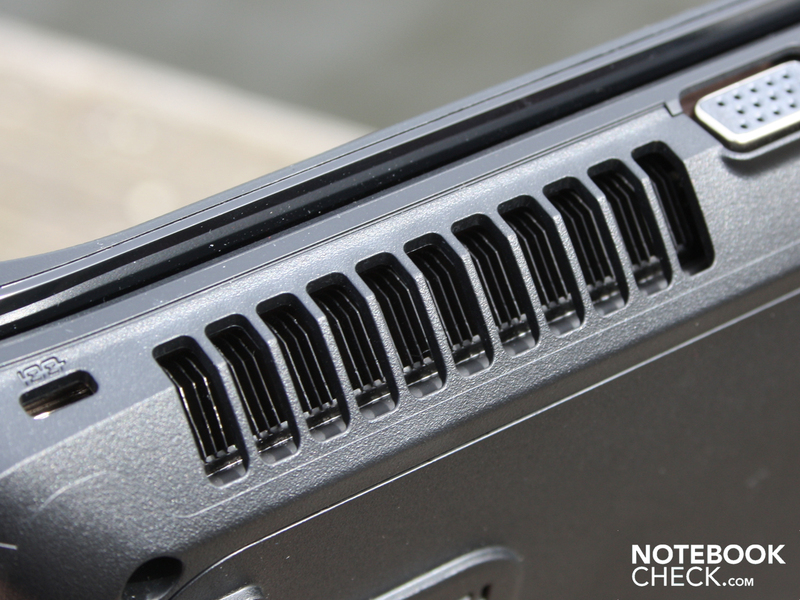 However, it does beat the Atom N550, which only achieves 512 points. The AMD Fusion APU C-50 (no 64 bit test) only scores 634 points in the single core benchmark. So, the AMD E-350 "fries" the Atom dual core. What does the application performance say, especially when we take a look at simple laptops with a Pentium CPU? 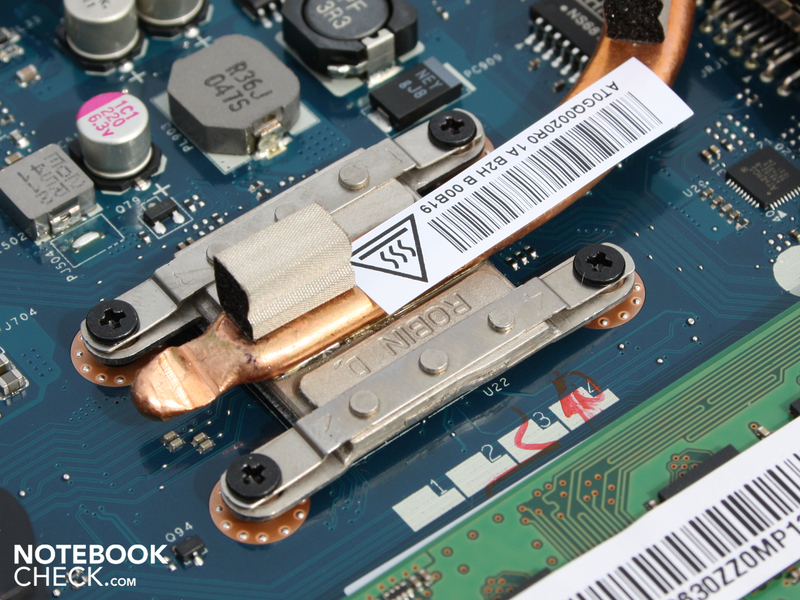 PCMark Vantage checks all components in a computer, including the DDR3 RAM, the hard disk and the HD 6310. This is a tight result of 2193 points, which is higher than netbooks with an Atom N550 (1601), but considerably lower than a Pentium P6100 (3772). The latter is already found in equally priced laptops (e.g. 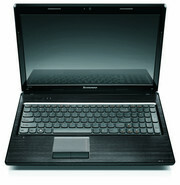 Toshiba Satellite C660, Fujitsu A530 or Lenovo IBM B560 – each alternative available). The subjective application performance is merely satisfactory. We partly experienced noticeable latencies. If you want a viable PC performance, you should rely on no less than a Pentium P6100 or, even better, Core i3. At least the incorporated HD 6310 can support the weak APU with high definition 1080p videos with the UVD3 video decoder. Consequently, the processor load doesn't increase extremely (1080p H264 smooth: CPU 20-40%). Other tasks can thus be continued without major delays. The Western Digital hard disk (model: WD3200BPVT), with a gross capacity of 320 GB, only displays average transfer rates of 62 MB/s (sequential read). 5400 rpm laptop hard disks usually are on par with 60 to 70 MB/s. 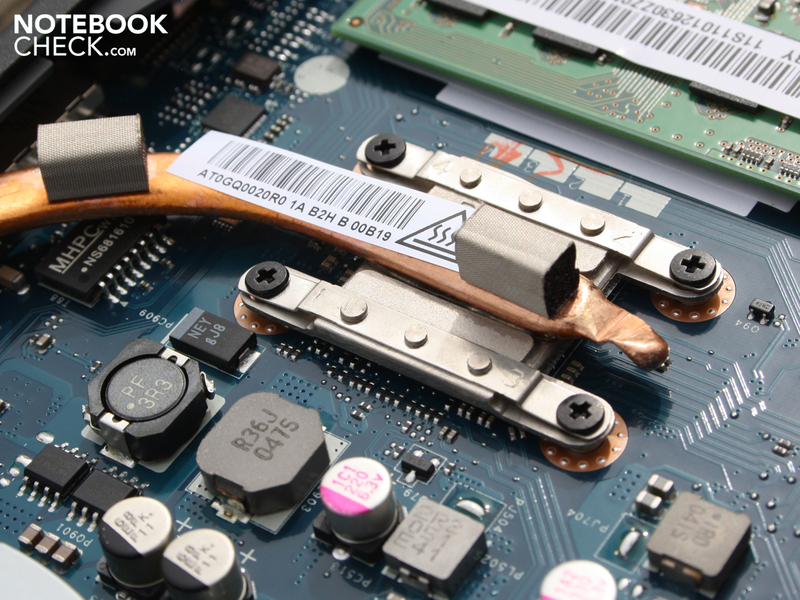 The HDD is only audible in operation with a quiet noise when we put our ear on the laptop. The test system achieves 1997 points in 3DMark2006. Thus, the Radeon HD 6310 is on the same level as a GeForce 9400M GeForceBoost (Ion 2). It can't hold a candle to dedicated entry level GPUs, such as the HD 6470M (+56%), which is also due to the weak APU processing performance. Even an entry GPU, like the Geforce 310M (Lenovo B560, 3114 points), is a bit faster than the Fusion. 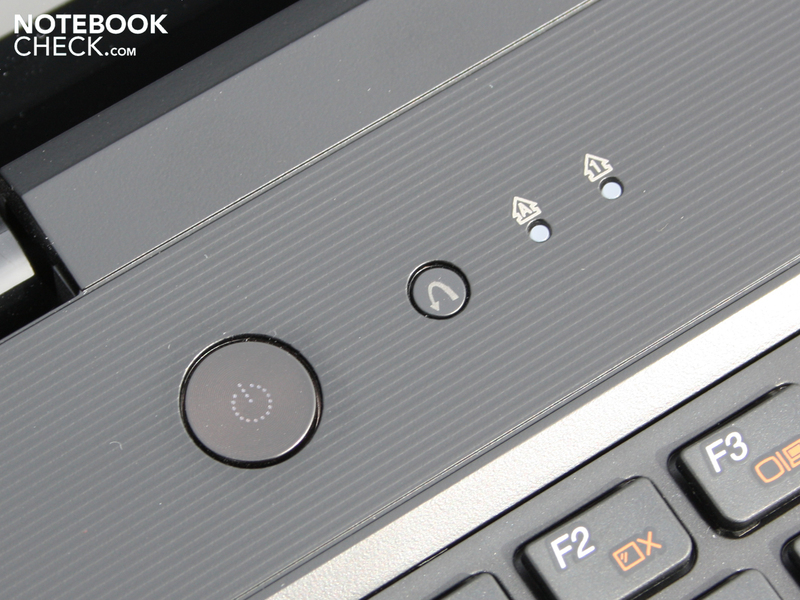 Gaming is thus only possible on a very low level, as we had proved comprehensively in the review of the Aspire 5253. The latest and even older, demanding games won't be possible. In the review of the HP Pavilion dm1-3180eg, with the same Fusion hardware, Fifa11 and Anno 1404 could be played. All gaming tests of this GPU are recorded in the HD 6310's spec sheet. Nobody wants a fan heater on their lap, especially in view of a weak energy savings system. 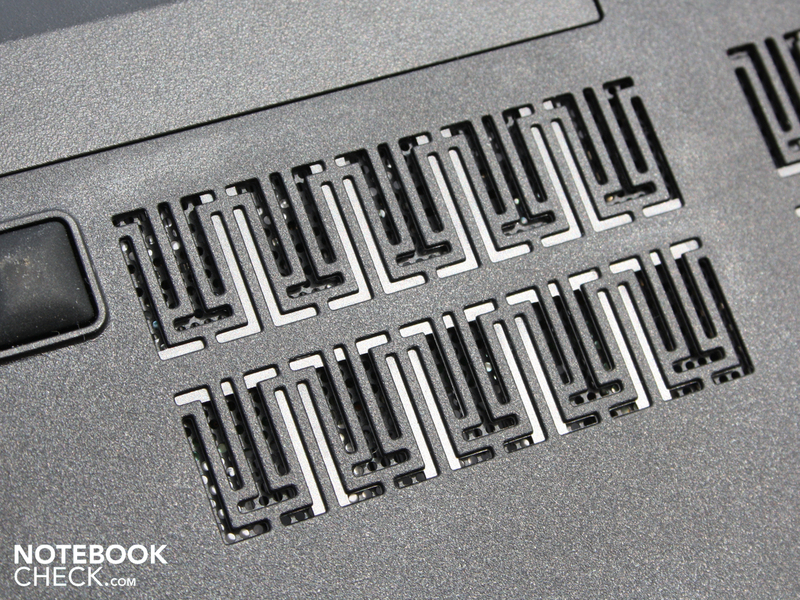 Since Fusion has been designed for netbooks, the cooling in a 15.6 incher shouldn't be a problem. However, the G575 isn't always as quiet as we would have hoped for. The fan alternately either doesn't run at all (30.6 dB(A)) or with a constant 34.6 dB(A) during surfing and writing emails. Unfortunately, there is no level between. The higher level is slightly annoying. A consistent rotation at 32 dB(A) would have been more pleasant. Users don't have to fear the maximum rate of 41.3 dB(A), which we can provoke during an unrealistic stress test. Both APU cores are fully loaded in the stress test (Prime95) and the HD 6310 processes the Furmark GPU test. In GPU load only, as in 3DMark2006, the level stays at a constant 39.6 dB(A), though. The fan quickly calms down to 34.7 dB(A) after the load, but stays there for a long time. Basically, we weren't satisfied with the fan's behavior. It is louder than many office laptops with a Pentium P6100 and IGP graphics during load. The G575 temporarily gets too loud during partial load and in idle, even when there's nothing, or almost nothing to be processed. Acer's AMD Fusion model, Aspire 5253, was much pleasanter here because it didn't get louder than 34 dB(A) even during maximum load. The bottom's average temperature while surfing and writing emails is merely 24 degrees. The wrist-rest heats up to only 25 degrees. The temperatures stay low in every operating mode. Thus, we can only provoke the 30 degree mark selectively during the stress test (top). 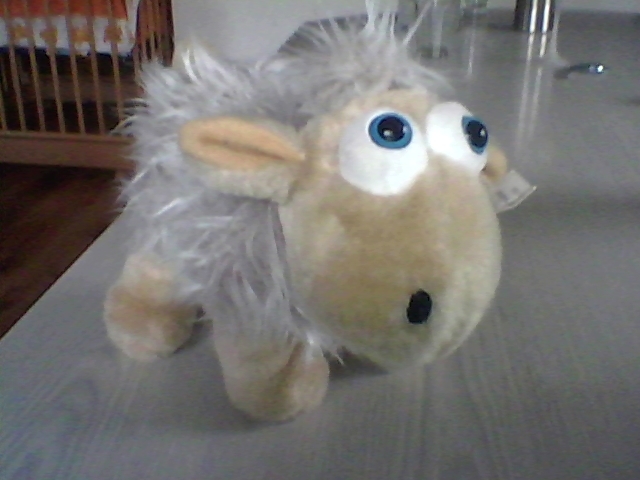 However, it doesn't look quite as good inside: APU and GPU report 99 degrees, respectively 88 degrees (stress test). This could be the reason why the E-350 throttles down to 800 MHz every few seconds (otherwise 1600 MHz). We noticed this throttling on the power meter: The volt meter's display varied between 23 and 28.8 watts every few seconds. Throttling DOESN'T occur when only the CPU processes the Prime95 test (100% load, constant 1600 MHz, HD 6310 not active). (+) The average temperature for the upper side under maximal load is 26.1 °C / 79 F, compared to the average of 29.4 °C / 85 F for the devices in the class Office. (+) The maximum temperature on the upper side is 30 °C / 86 F, compared to the average of 33.9 °C / 93 F, ranging from 21.2 to 62.5 °C for the class Office. (+) In idle usage, the average temperature for the upper side is 23.1 °C / 74 F, compared to the device average of 29.4 °C / 85 F.
The stereo speakers above the keyboard can only convince the undemanding office fan. The sound is distorted in maximum volume. However, that can be remedied with "Bass Enhancer" and "Virtual Surround" settings. What's left is midrange-heavy, but acceptable for an office laptop. The 15.6 incher can convince with 5:13 hours (WLAN test). 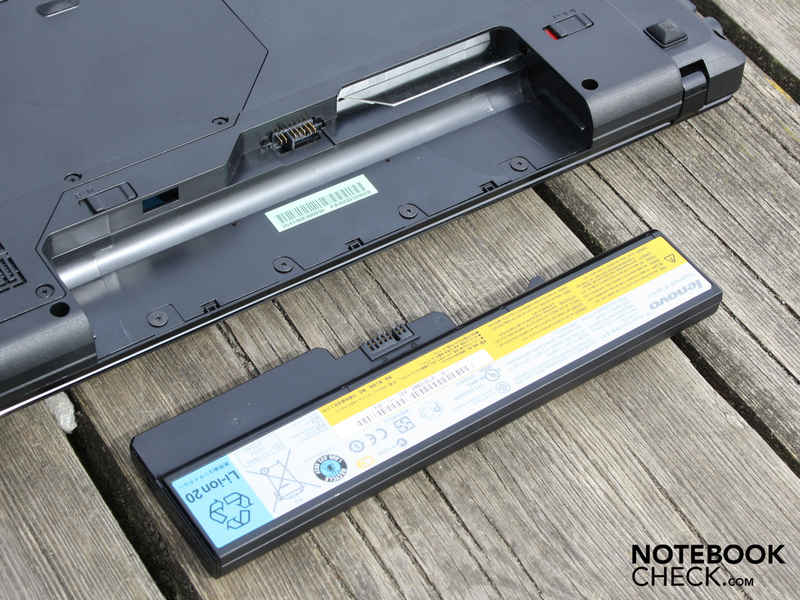 The fairly weak 48 Wh battery is no hindrance. The battery runtime test with a DVD movie recorded 3:31 hours. The battery is first recharged after 2:32 hours (charging) for the next movie session, though. 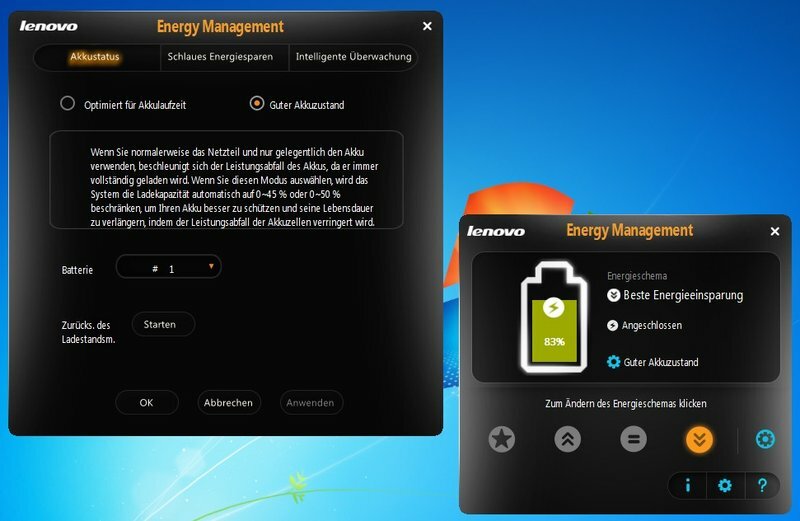 You can enhance the battery's life with Lenovo's energy settings if you don't use the battery often. The "Optimize For Battery Lifespan" mode limits the charge capacity to 0-50%. This reduces the cells' performance deterioration. The low-priced office competition with Pentium or AMD Athlon achieves three hours in the best case. 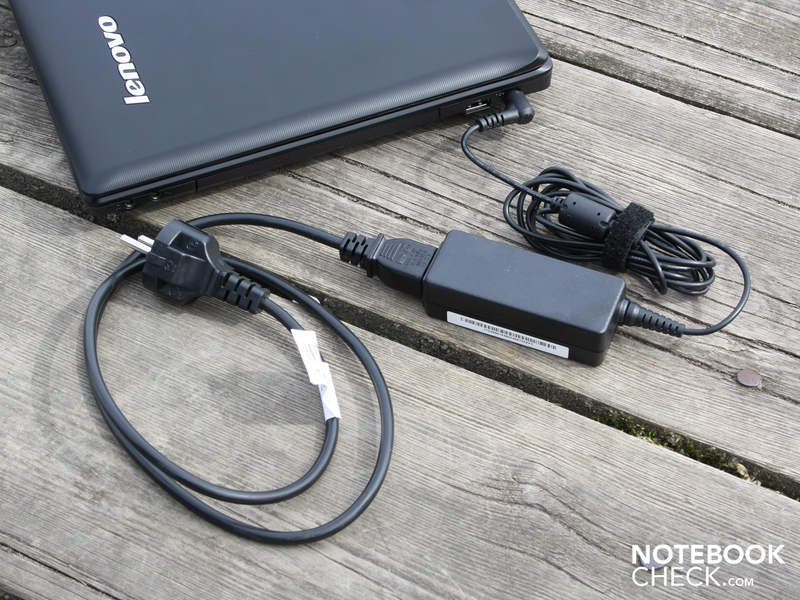 The Lenovo G575 excels them with five hours (WLAN test). 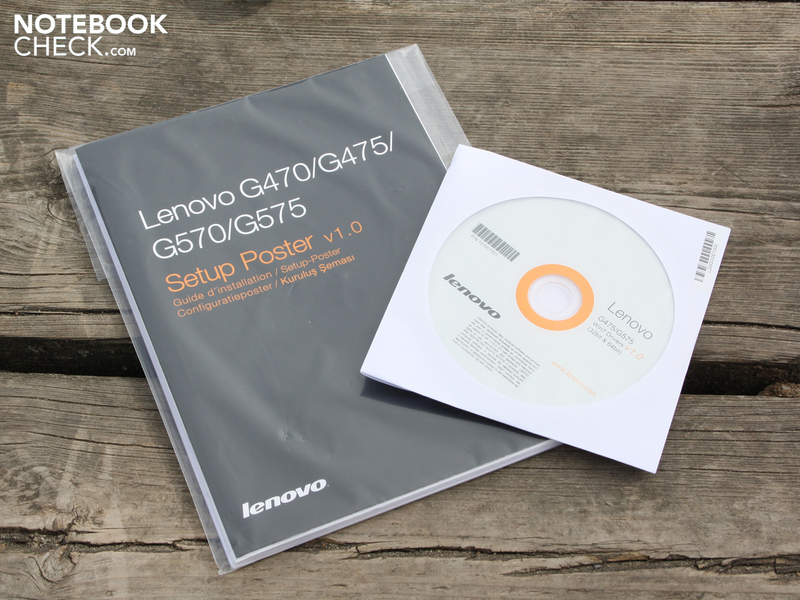 The Lenovo B560-M488TGE (P6100, 310M: 172 min) or the Asus X52F-EX513D (P6100: 178 min.) would be mentioned as an example. The lowest idle power consumption is only 7.9 watts. An average of 11.5 watts is realistic. This is the maximum power consumption that the 15.6 incher treats itself to in idle. The G575 is thus a top energy saver. An Aspire 5741G-334G50Mn (i3-330M, HD 5470) only consumes 29 watts, a Lenovo Thinkpad L512 (i3-330M, Intel HD) is satisfied with 9.2 watts (minimum power consumption of each). The effective power increases to only 20 watts when the HD 6310 is active during a 3DMarks2006. We determine the maximum power consumption in a stress test with Prime95 and Furmark. Now the multimeter climbs to 29 watts, whereas it repeatedly falls to 23 watts due to CPU overheating (see temperature screenshots). The small and light 40 watt power adapter is sufficiently sized in any case. 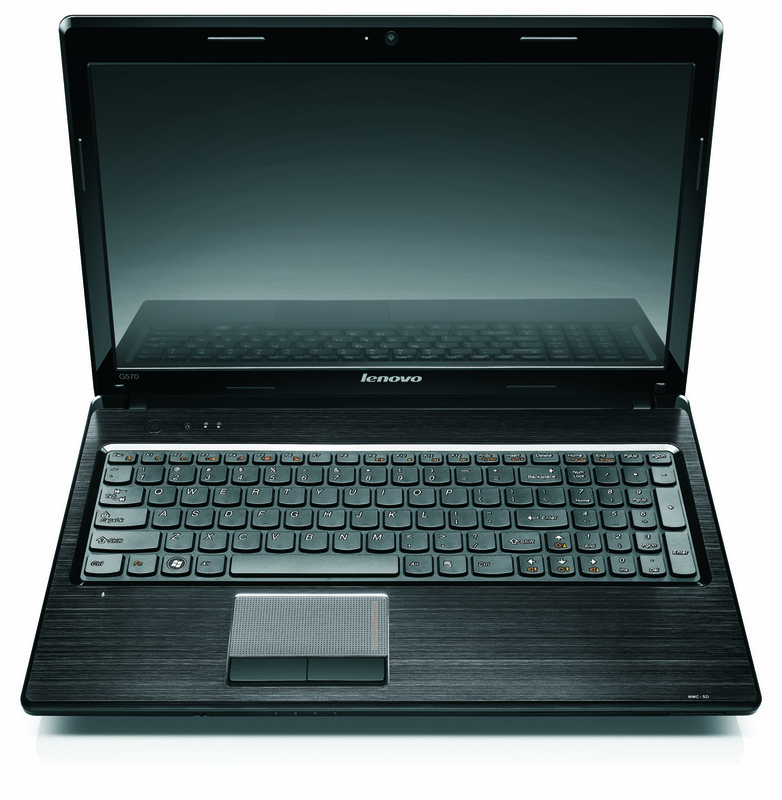 The Lenovo G575, with AMD Fusion and APU E-350 (processor), is a simple 15.6 incher with weak office performance. In return, it has clear advantages in terms of battery life and power consumption. The entire platform's low power requirement of 8 to a maximum of 29 watts supplies a practicable runtime of good two hours in maximum load, and up to five hours in web surfing. These are remarkable runtimes for a 299 to 399 euro laptop which will definitely attract buyers' attention. Down to earth users will love the matt and resistant surfaces (with exception of the TFT bezel) and the cool case. A real highlight in this price range is the feedback strong and quite accurate keyboard. Except for the partly minimized keys, the office input device hardly has any shortcomings. The drawbacks start with the reflective screen (weak contrast), which could ruin the use on the beach or in the park. The fan is much too often audible in idle and in relation to the system's low performance, makes too much noise during load. The few interfaces lack standards, such as HDMI and Bluetooth. The base unit can clearly be deformed and the hinges allow the lid to teeter. The acceptable workmanship is only justified by the low price. We could have lived with the weak dual core APU, AMD E350 (2x1.60 GHz) since it offers a pretty runtime of five hours in return. The outdoor unsuitable display and the exaggeratedly obtrusive fan are disappointing though. 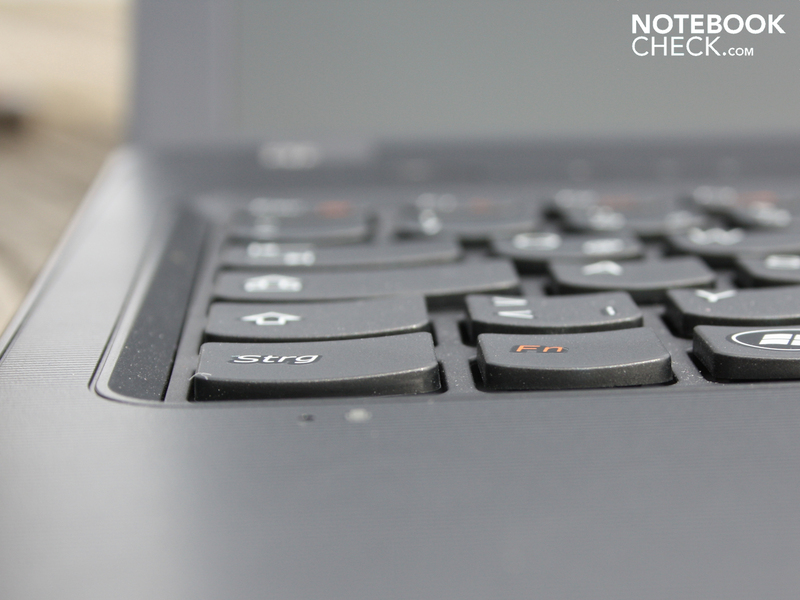 If you don't want to be satisfied with the performance of a dual core netbook, we would recommend low-priced office devices that have at least a Pentium P6100/AMD Athlon/Phenom or even better – with Core i3. These alternatives don't cost a lot more. 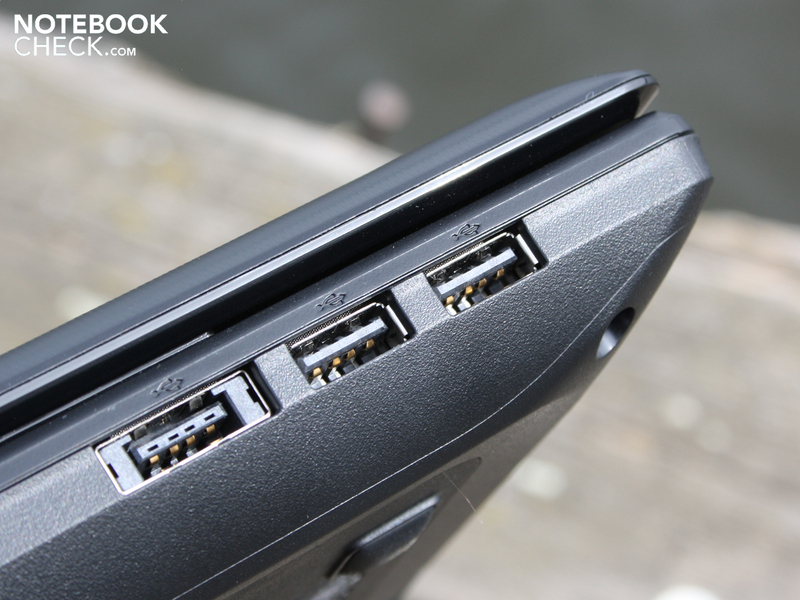 The Asus X52F (starts at 329 euros) or the Lenovo B560 (399 euros) can be named here. 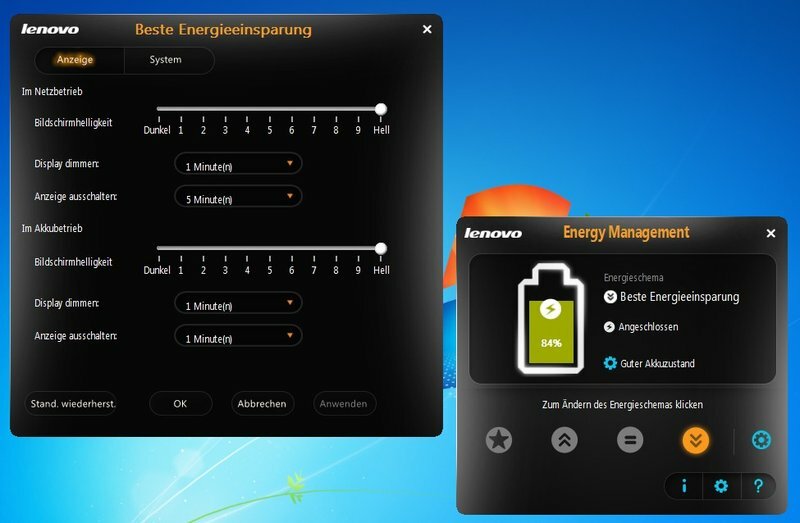 The battery runtimes are shorter depending on the device, but not extremely bad with, for example, three hours (Lenovo B560). The AMD Fusion APU E-350 is a processor model with incorporated graphics card. 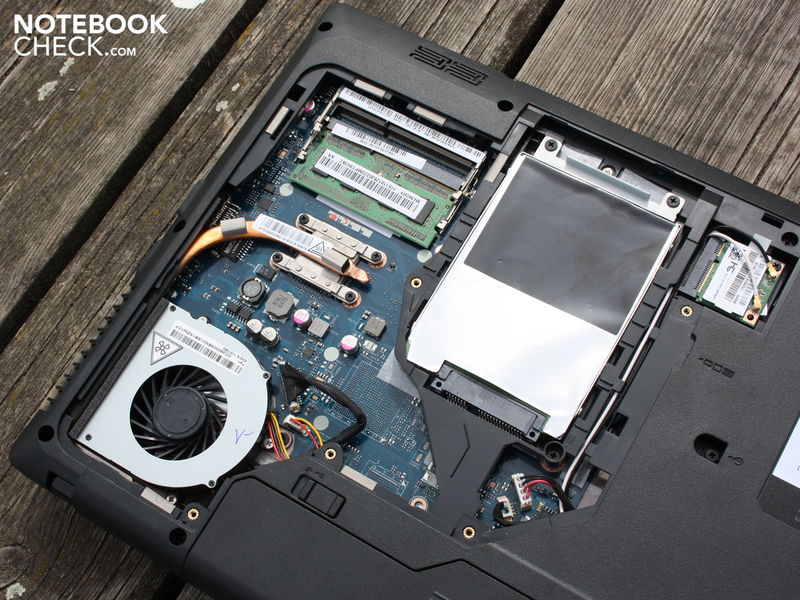 All upgradable components are found underneath the large cover. and the mini PCIe WLAN module (test device lacked Bluetooth). This small component is the AMD Fusion APU E-350. The battery keeps the 15.6 incher going for five hours. This is accomplished with a capacity of merely 48 Wh. 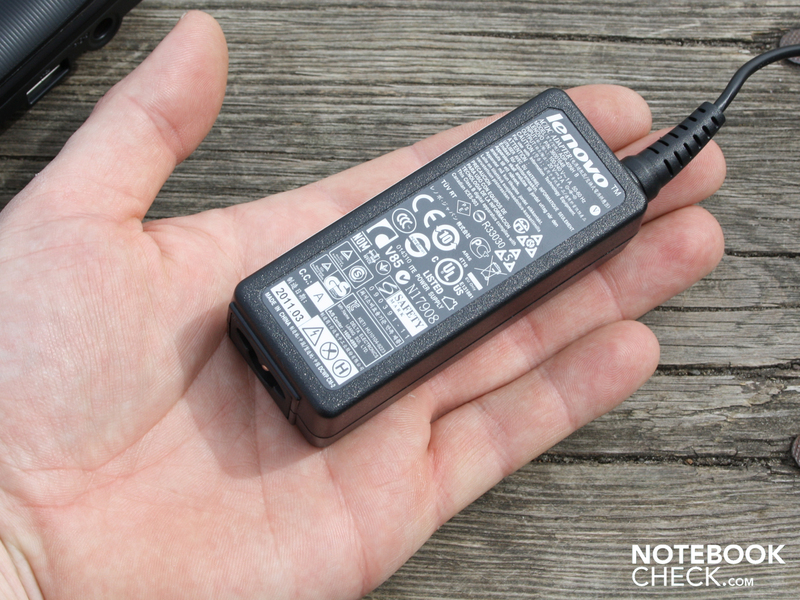 The handy 40 watt power adapter only weighs 152 grams. The free DOS G575 is delivered with a driver DVD. Windows 7 64 bit was operational with all devices. let the plain office worker stand out. In addition to four USB ports, there is VGA but no HDMI. 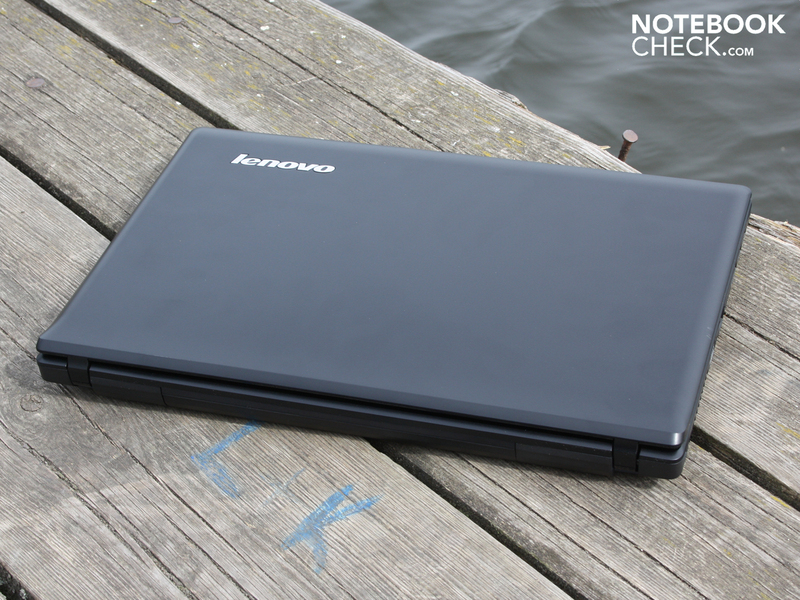 The platform designed for netbooks and subnotebooks are now offered by Lenovo. 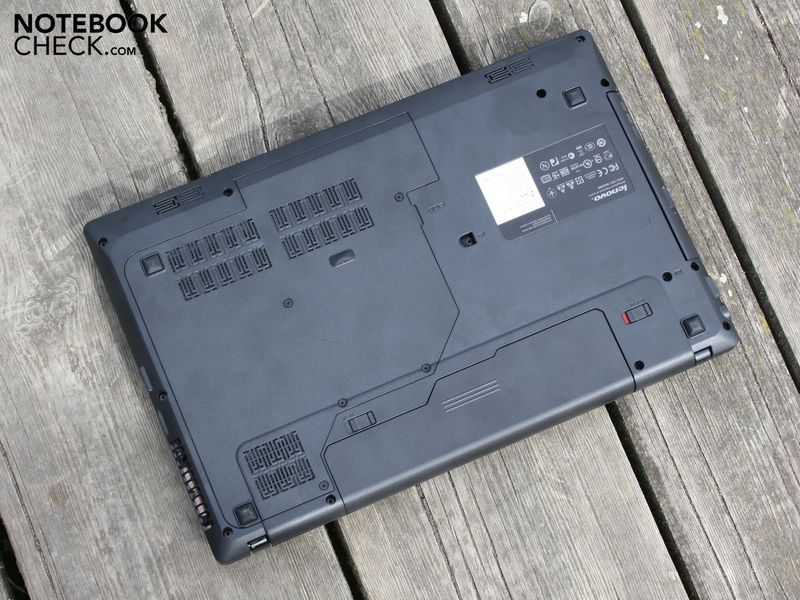 Surprisingly, the technology is installed in a 15.6 inch notebook. 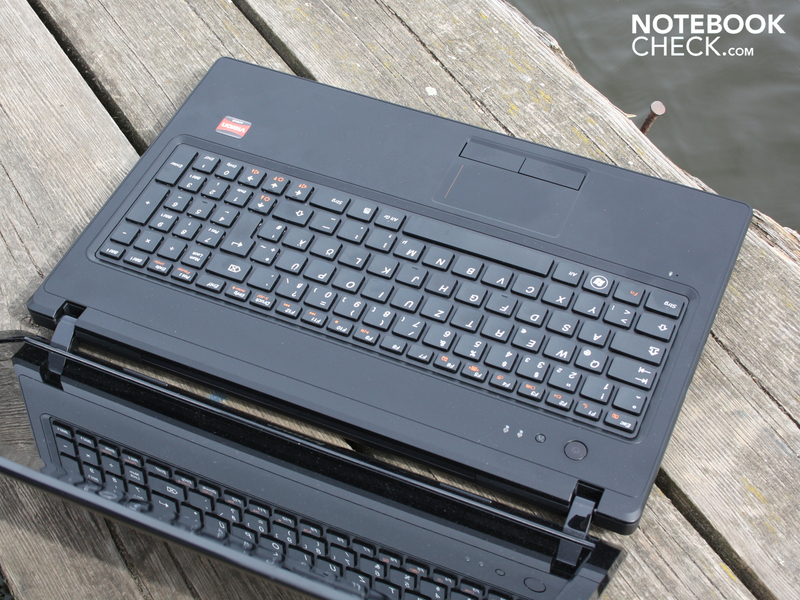 The Lenovo G575 is a robust office device with mostly matt surfaces. The keyboard with concave keys is outstanding for this price range. The squeezed in arrow keys and a few narrowed keys are the only flaw. The only glossy and sensitive area is the display bezel (webcam). The hinges have a somewhat wobbly hold on the lid and allow it to teeter evidently. Decorative elements, colors and dazzling power buttons have been omitted. Of course, the power button lights up (blinks in standby). Interfaces and switches are scarce commodity (WLAN on/off). Long battery life in an budget notebook. A matt and bright display for sun worshippers. This would even justify a shorter battery life. The fan doesn't remain permanently quiet despite low APU power consumption. It even makes a lot of noise during load.